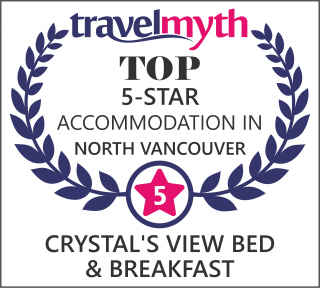 Located at the heart of North Vancouver, close to Lonsdale Avenue, Crystal's View B&B offers luxury, elegance, and beauty with 5-star amenities and hotel comfort. A home away from home. It is the perfect northern Vancouver getaway with a charming European touch. Large, bright, cozy, tastefully decorated rooms with downtown Vancouver and ocean view. Quiet neighborhood with a 5 minutes drive to Grouse Mountain, Lynn Canyon, Capilano Suspension Bridge, Lynn Headwaters Park. 15 minutes drive to the downtown Vancouver area and famous Stanley Park. It is also 15 minutes drive to Ambleside Beach, Cruise Ship Terminal and 25 minutes to Granville Island for whale watching. Easy access to bus routes, shopping, parks, hiking, and restaurants. We are also enroute to Whistler Ski Resort, BC Ferries from Horseshoe bay to Vancouver Island, and the Sunshine Coast. The world's second best highway with breathtaking views, Sea to Sky highway is around 20 minutes drive. You will be welcomed upon arrival with delicious homemade sweet treats paired with an assortment of teas, cappucino, or espresso to help you settle in. Experience the best British Columbia has to offer in this beautiful Bed and Breakfast. Your host, Crystal Davis, can help you make the most of Canada's west coast. If you need assistance in anything, simply ask. We offer our guests full concierge service in making restaurant reservations, sightseeing tours, in room spa packages, and any other activity you wish to expereince during your stay. Simply let us know the purpose of your trip and we'll inform you of some of the best places in Vancouver to make unforgettable memories. After exploring the city, hiking the North Shore mountains, or kayaking in nearby Deep Cove, rest your body and mind while sipping tea or coffee, and retreat to your room welcomed with freshly baked cookies, and a stunning panoramic view. Experience the unique beauty that the North Shore has to offer with its scenic landscapes, breathtaking nature, and escape into tranquility.